Dr Kizza Besigye, the former Forum for Democratic Change party president has been arrested from his home and whisked off to Nagalama police station. Officers from the Field Force Unit apprehended Besigye this morning when he stepped out of his home in Kasangati in Wakiso district to inquire what they were doing on his compound. 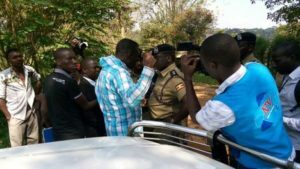 In a ‘preventive arrest’ move, police officers deployed early morning at homes of opposition politicians including Besigye, Ingrid Turinawe, the FDC Women League leader, Makindye West MP Allan Ssewanyana, Kampala Lord Mayor Erias Lukwago among others ahead of Kyadondo East MP Robert Kyagulanyi trial in the Army court in Gulu. Shortly before he was arrested, Kizza Besigye told the media that Ugandans ought to ‘wake up’ and take on the struggle to liberate the country from what he called current dictatorship under President Yoweri Museveni. He said Ugandans are fond of leaving the struggle to the few politicians, choosing instead to comment about the political dynamics in the country from social media rather than take part in the struggle. “Unless Museveni has capacity to barricade every home in Uganda, but whoever is not barricaded should do something…Now I have even seen some people on social media saying; ‘why did you sleep in your home? You should know that it will be barricaded. You should sleep somewhere.’ But, you, who’s not barricaded, you should do something. This is not about anybody, struggle is for everybody that is what every Ugandan must wake up to.” said Besigye. Besigye was dragged into a waiting police van infamously known as the ‘Besigye van’ and driven to Naggalama police station. 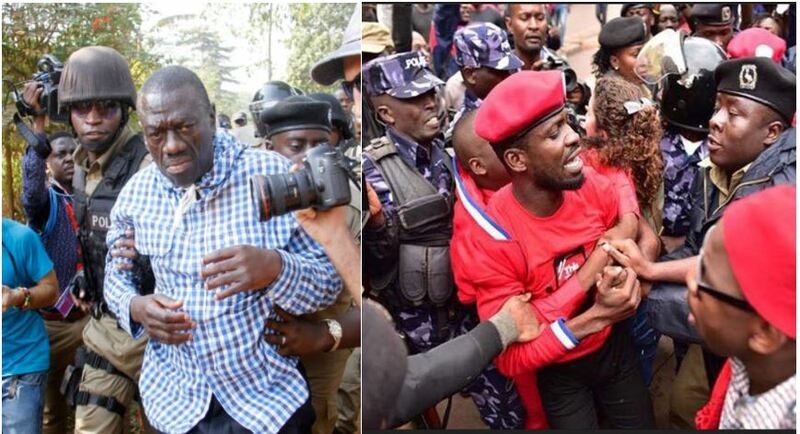 Kizza Besigye warned the state that arresting of a few opposition politicians will not silence the millions of disgruntled Ugandans out there. “Cutting off 10 people cannot be cutting off 40 million people. So people wherever they are must be able to do what they can with what they have in every place where they’re. The struggle cannot depend on Besigye, Lord Mayor Lukwago, Ssewanyana, Ingrid Turinawe – I don’t know who and the few homes that are being barricaded,” Besigye said. Luke Oweyesigire, the Kampala Metropolitan police spokesperson defended the deployment, saying they had received information that the said politicians were planning to cause violence in the city. “We have got information that these leaders are planning to cause violence and we cannot allow this to happen again,” said Oweyesigire. Last evening, police issued a statement indicating that they had foiled a plan to set Kampala city ablaze when they impounded two trucks loaded with old car tires. Since the arrest and detention of Kyagulanyi in Makindye military barracks, sporadic protests broke out in the parts of the city and neighboring districts – leading to the deaths of two people and the arrest of over 100. Kyagulanyi was arrested in Arua following the shooting dead of his driver Yasin Kawuma. Kyagulanyi alongside 33 others were accused of stoning the convoy of President Museveni last week who was also in Arua for the by-election campaigns. He was then arrested on August 14, tried in the General Court Martial on August 14 on allegations illegal possession of firearms and ammunition. He was subsequently remanded to Makindye military barracks until August 23. Today, the state dropped the charges of illegal possession of firearms and set him free. 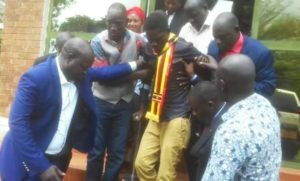 However within about less than a minute, Kyagulanyi was re-arrested and driven to the Chief Magistrate’s court in Gulu to face charges of treason. He was then remanded to Gulu prison until August 30. Last week, his co-accused who include three members of parliament, and about 30 civilians also appeared before the same court and were also charged with treason and remanded until August 30.